Limited spots remaining ... sign up today! Formerly the Silver Lake Inn, this circa 1903 house has been impeccably maintained and lovingly updated while still preserving it's vintage charm. 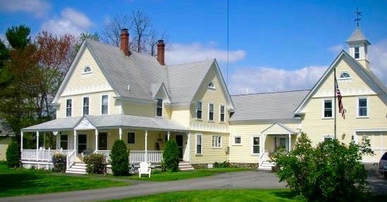 From it's wrap around porch with views of Silver Lake and the White Mountains to it's grassy bank along Forrest Brook and overlooking Mount Chocorua with fabulous sunrise and sunset views, all in close proximity to all the Mount Washington Valley has to offer, this is a wonderful place to rest, rejuvenate, retreat, recharge, write your book, conduct your small group event or mastermind meeting and connect with like-minded others in a comfortable, peaceful environment. Launch your canoe, kayak or paddle board from the backyard or walk across to the lake for swimming, fishing or sunbathing. In the winter, cross country and alpine skiing are nearby. Yoga and massage are available onsite along with many cozy indoor and outdoor sitting spots for you to curl up and enjoy a cup of tea, a good book, a nap or heart centered conversation. Located on the edge of the NH lakes region, nestled in the White Mountain National Forest, around the corner from the historic Silver Lake Railroad and just a few miles from the scenic Kancamaugus Highway, Ripple at Silver Lake is located in the village of Silver Lake in the lovely town of Madison. It's the perfect place to start and end your day of sightseeing, hiking, climbing, river rafting, skiing, shopping or relax after you wrap up your training workshop in our barn.